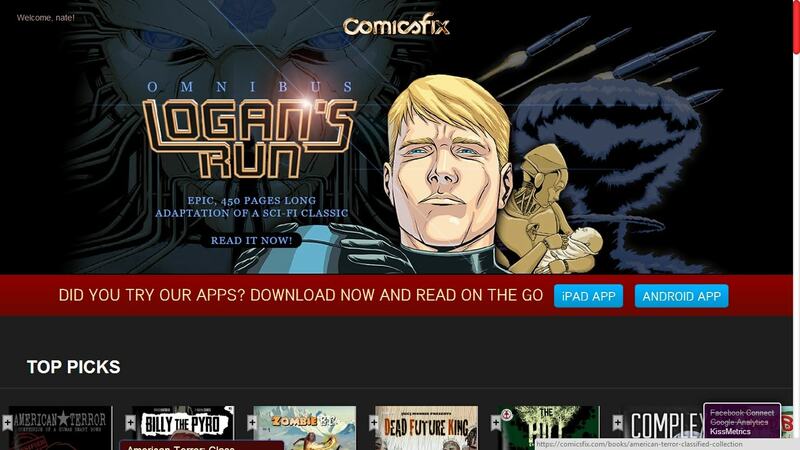 Has Anyone Tried ComicsFix’s Digital Comics Subscription Service? A non-new digital comics service crossed my desk this morning (discovered via Absolute Write), and since I had never heard of it (nor could I find much in the way of press coverage) I decided to post an open question and see if anyone was more familiar with it than I. Launched last fall, ComicsFix does for indie digital comics what Marvel Unlimited does for comic book series from that mega-publisher: it offers an all you can read style service which is available on Android, iPad, and in your web browser. Update: And now I know why I haven't heard of it. The service just launched a couple months ago. I thought it had launched last year, but that was just pre-launch coverage. So have you used ComicsFix? What do you think? I spent a few minutes with it this morning, and it's not bad. ComicsFix costs $10 a month (with a 2 week free trial), and while it doesn't offer titles from the major publishers like DC and Marvel, it does offer enough indie titles that I might want to read for me to think about keeping my subscription. I've added a dozen titles to my reading list from a variety of genres, and I would have added more except the site doesn't have a search function. There's also no way that I can see to list the participating publishers, so if you want to find a specific title you'll have a little bit of a problem. There's also no easy way for me to see my reading list when viewing the website, but I doubt the iPad and Android apps have this issue. (I must be in the minority; I prefer comics in a web browser rather than an app on Android). In terms of reading, it offers 1:1 zoom, full screen, and zoom to fit modes. It's supposed to remember the page I'm on, but I can't actually confirm that due to the difficulties in navigation mentioned above. In general the web app is readable. I'm still exploring the service, but I wanted to take a few minutes and pass along what could be a useful and cheap way to read comics. If you try it, let me know what you think of ComicsFix in the comments. We were given a press account at garpodcast.com when one of the comic artists we interviewed mentioned using the service. It’s a nice service if you’re into independent comics. It’s got a nice interface, lots of content, and works very well. The drawback of the service is the content- it’s REALLY independent, small press stuff. If you’re looking to read a comic from a major publisher, this isn’t the place to look. I’d also like to see a better recommendation system, but this is probably lacking because the service is so young and small. But again, I like the service. It’s great for readers who love comics but want to take a walk outside the Marvel/DC lines. At $10/month, you only need to read a few comics before the service has paid for itself, so it’s a bargain. I’m a fan, and I hope it succeeds. I’d love to see Comicsfix grow and become more well known. Scribd recently launched a similar service with some of the major publishers such as Marvel and IDW, but I think there’s definitely room in the market for both services as they seem to be catering for different markets.